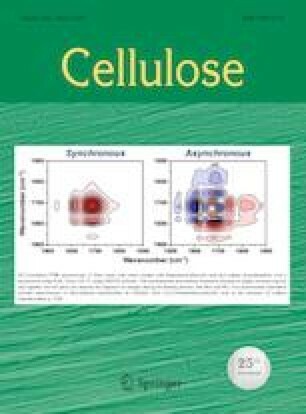 Although cellulose is the oldest macromolecule we have known, its intrinsic properties are still not well understood because of the lack of suitable solvents. The recent development of ionic liquids enables preparation of cellulose solutions in which cellulose molecules are supposed to be dispersed molecularly. Conventionally a semi-flexible-chain model or a worm-like chain model has been applied to describe the dilute solution properties of cellulose. A semi-flexible chain model is specified in terms of a persistent length to determine the chain stiffness of a solute molecule, completely neglecting details of the solvent–solute interaction, and the discussion is mainly focusing on the conformation of a solute molecule. In this paper we adapt a cylinder model which at least specifies the local shape of a solute molecule. Since the ionic liquids are now available as a new solvent of cellulose, we have prepared cellulose/ionic liquid solutions for small-angle X-ray scattering (SAXS) measurements which provide information on the local structure of cellulose molecules in the restricted range. The SAXS measurements were performed on the cellulose/ionic liquid solutions at two independent synchrotron facilities and confirmed the consistency of the observed scattering profile. Standard methods were applied to analyze the scattered data first, and afforded a model for representing a cellulose molecule in ionic liquid solutions. Two types of ionic liquids were used, and it was ascertained that cellulose was not degraded under the conditions used. The solution characteristic was found to change by heating during the preparation of each solution. The heating effect on the conformational change of cellulose was discussed in terms of the solute–solvent interaction from the simulation with a coaxial double layer cylinder model. The state of solvent packing was considered as well from the thickness and relative electron density of the sheath in the simulated coaxial double layer cylinder model. This work was performed under the approval of the Photon Factory Program Advisory Committee (Proposal Nos. 2014G604 and 2015G147) and the approval of the SAGA-LS (Proposal No. 1403013R). This work was financial supported by the Center for Fiber Textile Science in Kyoto Institute of Technology, and the Division of Chemistry of Renewable Resources, BOKU University Vienna. We gratefully acknowledge the work of past and present members of our laboratories.